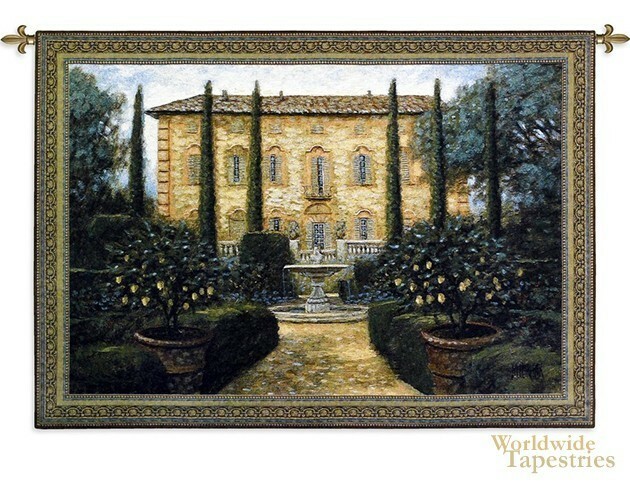 This tapestry "Italian Villa" shows a gorgeous Tuscan villa and its gardens by artist Jon McNaughton. Here we see the villa in resplendent yellow with a beautiful garden of poplars and potted fruit trees. Filled with masterly and beautiful use of color and composition, this piece bears the hallmarks of the works of McNaughton. Villas in Tuscany are renowned for their charm and traditional Tuscan architecture, and life in Tuscany is complemented by the fertile natural surrounds, the idyllic climate and rich tradition of art and culture which was the origins of the Renaissance period of art. This work reflects these aspects of life in Tuscany beautifully. This Tuscan tapestry "Italian Villa" is backed with a lining and has a tunnel for easy hanging. Note: tapestry rod and tassels, where pictured, are purchased separately.